We will invest and innovate to increase the number of youth we impact. Central to BGCB’s strategic vision is an outcomes-driven experience that helps members succeed academically, live healthy lifestyles and practice good citizenship. Fostering this sense of safety and belonging has been at the root of our service for 125 years. As times have changed over the decades, BGCB’s Clubs have remained a beacon of hope and opportunity for the young people we serve, providing safe spaces in which our members can learn and grow despite the challenges they may face at home or in their neighborhoods. From cobbling and woodworking to music production and wheelchair basketball, BGCB’s programs have evolved over more than a century. What has remained consistent is the dedication of our expert staff members, from aquatics directors to social workers, who serve as role models and create positive, lasting relationships with our members. In order to provide a safe, productive space for boys, Roxbury Boys Club opens. In 2006, the Club reopens following renovation and expansion, as the Yawkey Club of Roxbury. Frank S. Mason founds the Bunker Hill Boys Club. Doors open in Charlestown on March 11, 1893 with an initial membership of 38 boys. Bunker Hill Boys Club and Roxbury Boys Club merge as Boys Clubs of Boston, bringing together two strong institutions to create a more effective organization for the community. BGCB opens Camp Wing in Duxbury. Today, it offers full-day camps for seven weeks at each of its sites. South Boston Boys Club is founded, enlisting 500 new members in its first year. Then and now, Clubs serve as a beacon for kids looking for a safe place where they are accepted and protected without regard to the color of their skin. Girls, many of whom have been attending the Clubs since 1973, are officially admitted to all Clubs as full members. The organization is formally renamed “Boys & Girls Clubs of Boston,” the first in the country to include girls in the name. During a period of some of the worst gang violence in the city’s history, the Clubs use basketball to calm tensions. BGCB opens a site in the Innes Housing Development. In 2002, it moves to its new home and is renamed the Gerald and Darlene Jordan Club/Kraft Family Youth Center. A new center is constructed in Dorchester; during the inaugural summer season, more than 200 boys and girls learn to swim. In 2016, the Club is renamed the Berkshire Partners Blue Hill Club in honor of the long-standing and ongoing commitment of individuals at Berkshire Partners. Originally known as Youth Service Providers Network (YSPN), this partnership with the Boston Police Department features licensed clinical social workers who provide immediate intervention initiatives for vulnerable youth. BGCB assumes management of the Club at Dearborn Middle School in Roxbury, making it an additional “Shared Space” Club organized by BGCB. The Blue Hill Club is renovated. New features of the Club include the organization’s first Music Clubhouse, which can today be found in six BGCB locations. Two new Shared Space Clubs join the BGCB family thanks to Charles Sumner Elementary and Condon Elementary. In addition to offering a breadth of programming, such as homework help and music lessons, the new Shared Space Club’s proximity to the Blue Hill Club grants access to facilities such as the pool. Dearborn Club staff and membership relocate to a new facility at the Orchard Gardens Community Center. 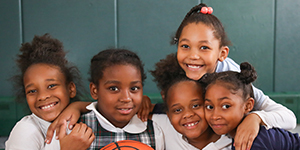 BGCB implements after-school programming at the James W. Hennigan Elementary School in Jamaica Plain, allowing BGCB to serve an additional 100 youth. The first standalone teen center welcomes 260 teens in its first year, with programs ranging from theater and fitness in its Foundation Room to production and recording in Mattapan Records. BGCB celebrates the 125th anniversary of opening its doors and creating opportunities for the children and teens of Boston and Chelsea. To achieve our strategic vision, we will invest in innovative programs that are both interesting and beneficial, so the young people we serve will visit us on a more frequent basis. Studies show that the more often children come to the Club, the greater the effect we will have on them. 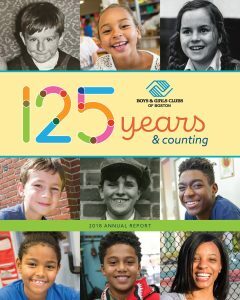 In our 2018 Annual Report, we reflect on the past 125 years of helping young people, especially those who need us most, build strong character and realize their full potential as responsible citizens and leaders. From cobbling and woodworking to music production and wheelchair basketball, BGCB’s programs have evolved over more than a century. What has remained consistent is the dedication and expertise of our leadership, staff, and donors. A print copy of this publication has been mailed to donors at the $500+ level. The online version includes all donors $100+ and is available by clicking on the cover image to the left. We're led by passionate individuals who are united by their drive to provide the best for the children of Boston. We're constantly on the lookout for new team members to join us in creating and administering innovative youth development programs.